... and the Shanghai Composite soared 2.9% after the U.S. and China agreed to halt new tariffs for 90 days. Commodities spiked and the dollar rebounded from session lows. The MSCI’s all-country world index rose 0.9% in its sixth straight day of gains and hit its highest level since Nov. 9 while emerging equities rose 2.1% and were set for their strongest day in a month. The gains came after China and the United States agreed during a Saturday dinner at the G-20 in Argentina to halt additional tariffs on each other. The deal prevents their trade war escalating as the two sides try to bridge differences with fresh talks aimed at reaching a deal within 90 days. If no deal is reached, Trump warned that the US will resume escalation, and hike tariffs to 25% from 10%. Oil soared 4% higher after dipping below $50 briefly last Friday, jolted by efforts across the globe to support prices as Saudi Arabia and Russia extended their pact to keep production low (although without providing details ahead of this week's OPEC+ meeting, while Canada’s largest producing province ordered unprecedented supply cuts. Optimism was dented slightly after Qatar said it was quitting OPEC, just as the group prepares to meet this week. The risk-on mood initially drove the U.S. dollar as much as 0.4% lower against a basket of currencies before trimming some losses. The greenback was already under some pressure from the recent shift in the Fed's policy communication to a slightly more dovish stance. Comments by Federal Reserve Chair Jerome Powell were interpreted by markets as hinting at a slower pace of rate hikes. Emerging currencies were among the main beneficiaries of dollar weakness, with an MSCI index up 0.6 percent. It was led by China's yuan which rose one percent for its biggest daily gain since Feb. 2016. The euro pared a gain after data showing manufacturing activity slowed, with factory growth stumbling again in November, as business confidence remains the weakest in 6 years. “Such positive sentiment won’t fade very soon ... (the 90-day) period is not short, it’s long enough to soothe market sentiment,” trader at a foreign bank in Shanghai told Reuters. Powell was scheduled to testify on Wednesday to a congressional Joint Economic Committee but his hearing is expected to be postponed to Thursday because major exchanges will be closed on Wednesday in honor of former U.S. President George H.W. Bush, who died on Saturday. While some have speculated that the trade war truce would bring back more hikes on the table, others disagreed: Florian Hense, economist at Berenberg, said the market rally would not bring a return to a more hawkish Fed stance. “We would need to see some rebound in economic activity to lift expectations of more rate hikes,” he said. Maybe not: in a Bloomberg TV interview, Fed Vice Chairman Richard Clarida said the US economy is in "good shape" and the outlook is "very solid" as the central bank is focused on meeting its dual mandate. He added that the concept of a “Powell Put" isn’t a useful concept, noting that the Fed could operate somewhat above 2% inflation goal. More importantly, Clarida said that the dot plot of Fed interest-rate forecasts "is not going anywhere", though it may evolve. Back to markets, where Asian shares kicked off the gains, with Chinese mainland markets rising more than 2.5% while Japan's Nikkei gained as much as 1.3% to a six-week high. European equities followed Asia’s response higher with miners and automakers leading gains in the Stoxx Europe 600 Index after President Donald Trump said in a late-night tweet that China agreed to “reduce and remove” tariffs on imported American-made cars. The tweet sent the Dax 2.5% higher as auto stocks were set for best day in 2-1/2 yrs on Sino-US trade truce. Just before midnight on Sunday, Trump tweeted that China had agreed to remove car import tariffs, even though in a briefing in Beijing a few hours later China’s foreign ministry spokesman Geng Shuang declined to comment on any car tariff changes. Trump gave no other details in his late-night tweet, which came shortly after he agreed with Xi to a truce in the trade war during a meeting at the Group of 20 summit in Argentina. Shares of German carmakers Daimler AG and BMW AG rallied Monday morning after the U.S. trade deal with China. Trump’s comments, if ratified, would also hand automakers like Tesla a potential reprieve after higher levies hit sales in the world’s biggest car market. In EMs, South Africa’s stock market was on course for its best day in four years, while Russian stocks climbed with the ruble as oil-production curbs spurred the biggest jump in Brent crude in two years. The peso advanced after a report that the new government was ready to re-purchase bonds issued to build Mexico’s City new airport. Meanwhile, in rates, ten-year Treasury yields rose back above 3 percent; the Australian curve bear steepens with 10-year yield three basis points firmer. Mexican peso rallies 1.3%, rand 1.1% stronger; won rose to its strongest since October. Germany’s 10-year government bond, the benchmark for the euro area, was set for its biggest one-day yield jump in a month, rising four basis points to a high of 0.347%. Yields on riskier southern European bonds fell across the board, with Italian yields sliding as much as 10 bps to new two-month lows. As noted above, WTI (+4.1%) and Brent (+3.9%) were both stronger following the positive US-China trade news and reports that Russia and Saudi Arabia are agreeing to extend the OPEC+ agreement; although no production cut figure has been announced so far. Additionally, Qatar, which produces approximately 600,000 BPD of oil, has announced that they are withdrawing from OPEC as of January with this being in-line with their long-term plan. Separately, Canada’s Alberta province is to reportedly mandate a 9% oil output reduction, which amounts to 325,000 BPD, in order to ease a supply glut with this to come into effect from January. Gold (+0.7%) was firmer, albeit off of a 3-week high of USD 1232.30/oz reached earlier in the session; after gaining support from the dollar being weighed on by positive US-China trade news from the G20 summit. Steel and copper prices have also benefited from the positive trade news, with Chinese rebar steel increasing by its 7% exchange-set trading; with copper’s London benchmark prices nearing a two-month high. Elsewhere in commodities, Chicago soybeans rally as much as 3.2%. Base metals gain with LME copper up 2%; Dalian iron ore 3.4% stronger. In other news, Italian PM Conte stated they are examining several options for a budget deal with the EU in which a solution could be made within days. 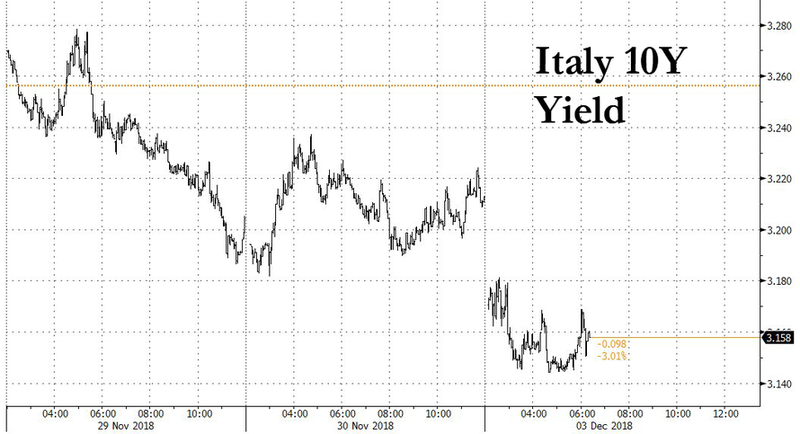 Later it was reported, that Italian PM Conte is reportedly preparing for a deficit of 1.9%-2.0%, while Italian Deputy PMs Salvini and Di Maio are said to be ready to accept new target, according to Messaggero. Italy's Deputy PM Salvini says that the EU cannot ask for a 1.9% target. In the latest Brexit developments, UK PM May was reportedly under renewed pressure as the DUP threatened to abandon support for her in a confidence vote if she failed to get her Brexit deal approved in Parliament. May's chief Brexit adviser Oliver Robbins secretly warned her the PM that customs backstop is a "bad outcome" for the UK which will see regulatory checks in the Irish Sea and put security co-operation at risk, according to the Telegraph. UK Secretary of State for Environment, Food and Rural Affairs Gove, has told Conservative rebels that there was a “real risk” of a second Brexit referendum if they don’t back PM May’s deal with Brussels. In geopolitical news, South Korean President Moon and US President Trump agreed to revive momentum regarding negotiations for North Korea denuclearization. In related news, South Korean President Moon said a visit by North Korean Leader Kim to Seoul is still open and possible this year, while US President Trump is said to be targeting a summit with North Korean leader early 2019. Expected data include manufacturing PMI and construction spending. Finisar, Coupa Software, RH and Smartsheet are among companies reporting earnings. Asian equity markets were higher across the board with global risk appetite boosted following the US-China trade truce at the G20. News of the tariff ceasefire spurred a rally in US equity futures in which the Emini S&P and DJIA futures reclaimed the 2800 and 26000 levels respectively, with the blue-chip index up nearly 500 points. 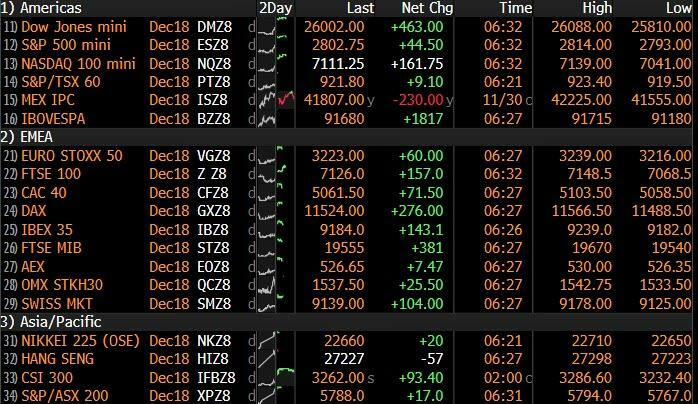 ASX 200 (+1.8%) and Nikkei 225 (+1.1%) advanced with Australia led by commodity-related sectors as energy benefitted from the positive trade developments and Russia-Saudi agreement to extend the OPEC+ accord, while the JPY-risk dynamic was very much in play for Tokyo trade. Elsewhere, Hang Seng (+2.4%) and Shanghai Comp. (+2.6%) outperformed on the easing of trade tensions, with sentiment also supported by better than expected Chinese Caixin Manufacturing PMI and after the CFFEX relaxed domestic stock index futures trading conditions. Finally, 10yr JGBs initially saw a bout of weakness at the open amid the heightened risk appetite, although prices later recovered amid the BoJ’s presence in the market for JPY 800bln of JGBs with maturities of up to 5yrs. European equities (Eurostoxx 50 +1.8%) trade with firm gains as markets react to the fallout of the G20 summit which saw US President Trump and Chinese President Xi Jinping agree to delay hiking tariffs on USD 200bln of Chinese goods to 25% for 90 days to allow for trade discussions between the two nations. In terms of sector specifics, mining names have been the main beneficiary from the trade optimism thus far with price action in metals markets giving a lift to Antofagasta (+8.0%), Arcelormittal (+6.6%), Anglo American (+6.3%), Glenore (+6.5%) and many more. Elsewhere, luxury names are also seeing some reprieve from the US-China developments with the sector previously hampered by tensions between the two nations; as such, Swatch (+6.1%), Kering (+5.5%), LVMH (+4.3%) and Burberry (+3.3%) all trade with firm gains. Auto names are also seen higher amid the spillover from US President Trump tweeting that China has agreed to reduce and remove tariffs on cars coming into China from the US which are currently at 40%; BMW (+6.1%), Daimler (+6.2%), Volkswagen (+3.9%). Finally, tech names have also been supported by the weekend’s developments with tech a key focus for negotiations, subsequently, STMicroelectronics (+7.3%), Infineon (+5.8%) and Wirecard (+4.4%) are also near the top of the Stoxx 600 leaderboard. FX: DXY, CNY, JPY – An optimistic end to the G20 summit with Trump and Xi agreeing on a 90-day tariffs ceasefire until a trade deal can be negotiated (with sticking points such as IP remaining). As such DXY fell to lows of 96.710 vs. last week’s low of 96.622, though the index is nursing losses in an attempt to take another jab at 97.000. USD/CNY fell below the key 6.90 level despite a higher USD/CNY fix by the PBOC overnight, while JPY unwound some risk premium with USD/JPY stopping just shy of 114.00, but the headline pair supported just ahead of a downside tech-level (Tenken at 113.34). AUD, NZD, CAD – Major high-beta beneficiaries in the aftermath of the G20, with AUD/USD within striking distance of 0.7400 (where 1.365bln in option expiries lie) ahead of its 200DMA at 0.7418, while the Kiwi holds above 0.6900, marginally hampered by weaker than expected Q3 terms of trade and softer export volumes. Meanwhile, CAD also takes advantage of the rising oil prices after Russia and KSA extended their OPEC+ pact, on top of the tactical 325k BPD production cut at Canada’s Alberta refinery. USD/CAD currently sub-1.3200 but off post-G20 lows of 1.3160. GBP, EUR - Little reaction in the pound and the single currency following mixed manufacturing PMIs with Cable back down below 1.2750 (after having breached its 10DMA at 1.2800 where stops were reportedly tripped) and through the Raab-low at 1.2724 to test bids ahead of 1.2700, while EUR/USD couldn’t sustain gains to 1.1400 before retreating through 1.1350 and towards 1.1300. Note, the single currency was supported earlier on Italian press reports that PM Conte is said to be preparing for a deficit/GDP target in the range of 1.9%-2.0%, with the Deputy PMs apparently ready to accept the new target but has eased back in wake of the ECB’s announcement of Capital Key changes, including a perhaps surprisingly lower Italian ratio. In terms of option expiries, EUR/USD sees 1.32bln around 1.1380-90 ahead of reported offers at 1.1400. EM – TRY back in focus with softer than expected Turkish CPI helping the Lira retest recent highs around 5.1500 vs. the buck at one stage, but unable to breach resistance as the USD stage a broad comeback. In commodities, WTI (+4.1%) and Brent (+3.9%) are both stronger following the positive US-China trade news and reports that Russia and Saudi Arabia are agreeing to extend the OPEC+ agreement; although no production cut figure has been announced so far. Additionally, Qatar, which produces approximately 600,000 BPD of oil, has announced that they are withdrawing from OPEC as of January with this being in-line with their long-term plan. Separately, Canada’s Alberta province is to reportedly mandate a 9% oil output reduction, which amounts to 325,000 BPD, in order to ease a supply glut with this to come into effect from January. Gold (+0.7%) is firmer, albeit off of a 3-week high of USD 1232.30/oz reached earlier in the session; after gaining support from the dollar being weighed on by positive US-China trade news from the G20 summit. Steel and copper prices have also benefited from the positive trade news, with Chinese rebar steel increasing by its 7% exchange-set trading; with copper’s London benchmark prices nearing a two-month high. I hope you all had a good weekend. The lowlight/highlight of mine was the monthly medal at my golf club where having played quite well for 17th holes, I hooked my final drive out of bounds into Liam Payne from One Direction’s house alongside the 18th. The Story of my Life!!! The story of the weekend was a 90 day ceasefire in the US/China trade war albeit without resolving the structural issues between the two. From the G20 summit we learnt that in this period the US will not now increase tariffs on more than $200bn of Chinese goods from 10 to 25% as had been planned in January. Meanwhile, China have commited to purchase a “very substantial” amount of farm, energy and industrial goods in order to reduce the trade gap with the US. Although no specific numbers were provided. Also in this three month truce the US have insisted on talks on China’s alleged intellectual property theft and forced transfer of technology. Failure in talks in this regard would result in a new escalation of tariffs. There’s little doubt this outcome is positive short term and hopefully supports our more bullish tactical bias we’ve had over the last couple of weeks but we’ll see how long before the market starts to worry about what happens as the 90 days draws to an end, especially if little progress is made early on in this period. The regular press briefing by China’s Ministry of Foreign Affairs at 3.00 pm Beijing time (7am London) could be of interest this morning to gain further insights on what was agreed at the US-China meeting over the weekend including on car tariffs as US President Trump has tweeted overnight that China has agreed to “reduce and remove” car import tariffs. So one to watch. This morning in Asia markets have opened the week with a risk-on bias after the temporary thaw in the US-China trade war. The Nikkei (+1.34%), Hang Seng (+2.68%), Shanghai Comp (+2.91%), and the Kospi (+1.61%) are all up as all indices are higher. Most currencies are trading up against the greenback with export oriented economies benefitting the most. The Australian dollar (+0.85%), Chinese yuan (+0.62%), Turkish lira (+0.79%) and South African rand (+1.24%) are all higher. Oil (WTI +5.30% and Brent +4.89%) is also up in early trade benefitting from the agreement between Russia and Saudi Arabia to extend output cuts into 2019 and Canada’s largest oil producing province Alberta ordering an unprecedented output cut of 325,000 barrels/day to reverse falling prices. In other commodities, agriculture futures jumped in Chicago on China’s promise to immediately increase US farm produce purchases substantially. Soybean futures (+1.82%), Wheat (+1.50%) and Corn (+1.19%) all up while metal futures advanced in Shanghai with Copper (+1.35%), Zinc (+3.80%) and Aluminium (+1.47%) higher. Elsewhere, futures on the S&P 500 (+1.77%) are pointing to a substantial gap higher at the open and 10yr Treasuries are +5.5bps higher at 3.045%. In terms of overnight data releases, China’s November Caixin manufacturing PMI came in at 50.2 vs. 50.1 expected and Japan’s final November manufacturing PMI came in at 52.2 (51.8 in the flash read and 52.9 in the previous month). Also over the last couple of days we’ve seen a third weekend of major riots and political protests in Paris with quite extreme scenes in the capital. In the four biggest countries in Europe its fair to say that politics remains tense. In France the anti-establishment Macron is struggling with reforms and popularity 17 months into his premiership. In the U.K. we are struggling with Brexit and all the ramifications. In Italy the populist Government are at loggerheads with the EU and at a debt precipice, and in Germany the ruling CDU and CSU are seeing their support at multi-decade lows. The world of politics is certainly in some turmoil at the moment. In other news, In other news, over the weekend Italian daily La Repubblica reported that EC President Juncker has asked the Italian Premier Conte to lower the budget deficit target for next year to 1.95% from the planned 2.4% seeking about €4.5bn of spending cuts to avoid sanctions. Notably this is lower than the EC’s earlier demand from last weekend of €6bn-7bn of spending cuts indicating that both the sides are trying to find some common ground. Indeed headlines are coming through as we go to print that the government might be considering this (per Italian daily Messaggero). On Brexit, the Labour Party said over the weekend that it will propose a motion to bring down PM May’s government if it fails to get the Brexit deal through the parliament on December 11. The Times has also reported that the DUP is considering removing its support for the UK government if UK PM May fails to get her Brexit deal through Parliament. Elsewhere, Scotland’s First Minister Nicola Sturgeon is likely to appeal to UK parliamentarians today to use amendments to the parliamentary vote next Tuesday to block a no deal Brexit, and extend Article 50 to give Parliament time to agree “a better way forward”. Moving on, as today is the first on the month we have just published our usual monthly and YTD performance review. We’ve decided to continue to trial it as a stand-alone document rather than at the end of the EMR. So see here for more details. Included is the update of our chart showing that this is the worst year on record (back to 1901) for the percentage of global assets down on a dollar adjusted basis. As for this week, now the G20 is out the way the main events to focus on this week are the OPEC/OPEC+ meeting (Thursday/Friday), the November employment report in the US (Friday), the global November PMIs (today and Wednesday), Fed Chair Powell's speech in front of Congress (Wednesday but should be cancelled - see below) and the German CDU leadership battle to succeed Mrs Merkel (Friday). Brexit will be never be too far from the headlines as Parliament starts a 5-day debate on the topic early this week. One final thing to be aware of is that US financial markets will be closed on Wednesday to honour President George HW Bush who died over the weekend, as per tradition. This would likely mean Powell’s testimony won’t take place on Wednesday but we haven’t seen confirmation of this yet. Given the -28% fall in the price of Oil since the peak 8 weeks ago, the biggest of these events this week is potentially the OPEC/OPEC+ meeting on Thursday and Friday in Vienna. The big question facing the market is whether a consensus can be formed between Saudi Arabia, Russia and the US, especially with US President Trump recently raising the pressure level on Saudi Arabia to keep prices low through raising production - a strategy which has seemingly worked given the recent falls. At the G20, Russia and Saudi Arabia agreed to extend their deal (OPEC+) to manage the oil market into 2019 without confirming any fresh output cuts. With Powell last week effectively signalling a shift towards data dependency then we might be back to caring about the headline payroll number again rather than just average hourly earnings. So Friday’s employment report perhaps starts a renewed focus. Consensus is for a 205k reading following a stronger-than-expected 250k reading in October. For earnings, the consensus is currently pegged at a +0.3% mom average hourly earnings reading, which would be enough to nudge up the annual rate to +3.2% yoy. The unemployment rate is expected to hold steady at 3.7%. Wednesday may or may not see Powell testify to the Joint Economic Committee of Congress on the economic outlook. It could be moved to another day. Whenever it takes place this performance might have been overshadowed by last week’s market moving speech but it could be a chance for him to endorse market reaction or try to redress the interpretation. However here he is representing the Fed so it’s hard to see him deviating much from the minutes released last week. 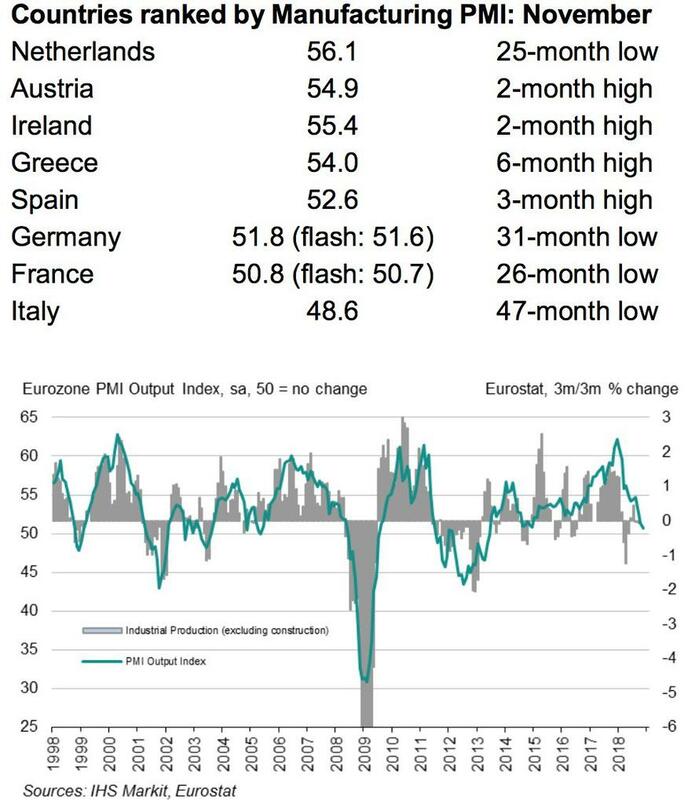 Elsewhere the final global November PMIs should also be closely watched given the uncertainties over growth at the moment - especially in Europe. We'll get the manufacturing numbers today and the services and composite data on Wednesday. For the Euro Area, no change in the flash readings of either the manufacturing (51.5) or services (53.1) is expected. The Italy data is likely to be a focal point however in light of the composite falling to 49.3 in October. The rest of the week ahead is at the end but before that a quick recap of last week. Markets rallied on Friday ahead of the G-20 summit. The S&P 500 and the NASDAQ both had their best weeks since 2011, gaining +2.99% and +6.46% respectively (+0.52% and +0.82% on Friday), on the combination of more constructive trade rhetoric and dovish-leaning comments from Fed officials (especially Chair Powell on Wednesday). The DOW and NYFANG indexes gained +5.16% and +6.86% respectively (+0.79% and +1.48% Friday). Still, ten-year Treasuries closed below 3.00% for the first time since mid-September, falling -5.1bps on the week (-4.2bps Friday), while Bund yields reached their lowest level since August at 0.31% after falling -2.7bps on the week (-0.8bps Friday). Further boosting sentiment on Friday was some robust economic data in the US, as the MNI Chicago PMI rose 8pts to 66.4, its third highest print of the cycle. Notably, the new orders subindex rose to 72.5, its highest level since 2014. Attention will focus on the ISM manufacturing report due this afternoon, where consensus expectations are for a 0.2pt drop to 57.5. As long as US data continues to signal above-trend growth, the Fed will be less likely to follow-up on its dovish rhetoric with an actual shift in policy away from the current pace of roughly quarterly rate hikes. So interesting times ahead. Other markets also had a positive week, with the STOXX 600 up +0.99% (-0.17% Friday) and the Nikkei gaining +3.25% (+0.44% Friday). The DAX, CAC, and FTSE MIB gained +0.58%, +1.15%, and +2.53% respectively (-0.36%, -0.05%, and +0.15% Friday). Emerging markets equities performed well, gaining +3.37% in dollar terms (-0.10% Friday), though currencies were mixed, with the index rallying +0.05% (+0.54% Friday). Though Brexit continued to generate headlines, the pound shed only -0.51% (-0.33% Friday), which was close to in line with the dollar’s broader strength, as the greenback gained +0.29% on the week (+0.44% Friday) even with the Powell relent.